WoNderLaNd: Do Faeries Live at the Bottom or Your Garden? Do Faeries Live at the Bottom or Your Garden? "Even if you believe in fairies, as I personally do, there will always have been an "element of doubt in your mind that would suggest the remains are a hoax. However, the magic created by the possibility of the fairy being real is something you will remember for the rest of your life. Alas the fairy is fake but my interest and belief has allowed me to create a work of art that is convincing and magical. I was also interested to see if fairy folklore is still a valid belief in modern society and I am pleased to say that yes it is! I have had more response from believers than I ever thought possible." The images and selected parts of the description were soon posted on other websites, forums and blogs and also began circulating via email. However, many of the circulating versions did not include the artist's statement owning up to the prank. The model is of such good quality, and the description so convincing, that many people truly believed that the "find" was genuine. 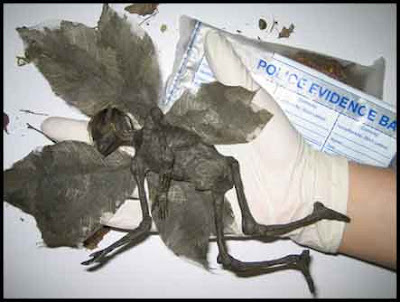 According to the description that accompanies these photographs, they show the remains of a fairy that was discovered by a man walking his dog between villages in Derbyshire, England. The photographs also circulate without any description and refer to the remains as a "Butterfly Man" in the email subject line. 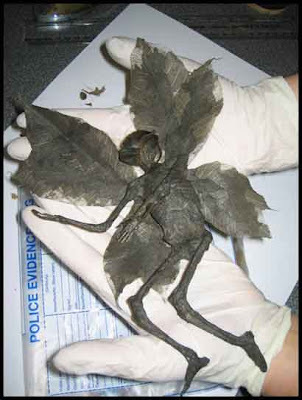 However, the fairy depicted in the photographs is actually a model created as an April Fool's Day prank by UK artist and magician, Dan Baines. Humans have long had an intense fascination with magical creatures. Perhaps, deep down, many of us would like to believe that fairies really do live at the bottom of our gardens. The surprising popularity of the Derbyshire fairy suggests that it has successfully tapped into that deep-seated human fantasy. In fact, despite the artist's public statement, some have refused to believe that the fairy is not real and have even suggested a government conspiracy. On April 8, 2007 the fairy was sold on eBay for £280.00 and, according to the BBC, is now in a private art collection in the United States.